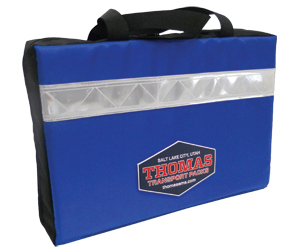 The Thomas O2 Lite is a compact airway bag designed to accommodate all O2 and airway supplies when storage space is tight and multiple carrying methods are required. The lid section has been engineered to open and remain upright during use to minimize supply loss and speed treatment time on scene. 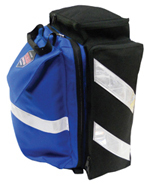 The modular, removable and adjustable clear vinyl inside pockets are designed for maximum visibility and quick access of all airway supplies. fluid free fabricThe 02 Lite features a fluid resistant, quick wipe down exterior material, hide away backpack straps, a shoulder strap, multiple padded handles, and Hi-Vis reflective striping. The 02 Lite can be stored either vertically or horizontally in your response vehicle with no shifting of equipment. The ideal specialized, dedicated 02 pack for agencies that are looking for an easy wipe-down, compact, organized, and highly durable and versatile airway equipment solution. 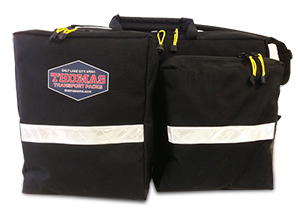 Thomas EMS Aeromed Pack aeromed trauma packOne of our best selling packs, the Aeromed pack is an extremely space efficient and durable pack. The Aeromed Pack is specifically designed for initial care of the critically ill or injured patient. The Aeromed Pack is most commonly used for ambulance, search and rescue, high rise rescue, helicopter or as a personal medical kit. In addition, the Aeromed Pack is an excellent specialty kit for trauma, pediatric, neonatal, burn, obstetrical, cardiac or respiratory patients. The Aeromed Pack Features: �4 interior color coded vinyl window pockets �3 medium exterior pockets �2 large exterior pockets �1 large hidden pocket �3 small vinyl window interior base pockets The placement and closure of these pockets is specially designed to reduce the likelihood of equipment loss. 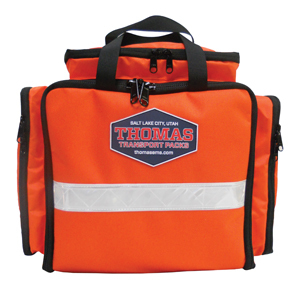 The color coding and clear vinyl front pockets allow rapid location access of equipment and supplies as well as quick re- stocking. The D rings on the back of the pack allow shoulder straps to be easily attached. The ladder frame of the pack can also serve as a splint when needed. Dimensions: 11" x 12" x 5" *Does not include backpack straps. Backpack straps sold separately. 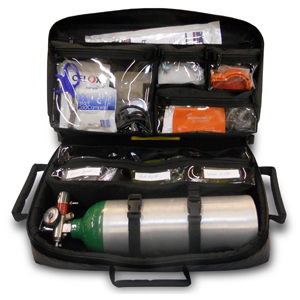 The Emergency Medical Pack will carry a "C" sized oxygen bottle with lateral mount regulator, airway equipment, I.V. fluids, and drugs necessary in the early care of critically ill or injured patients. 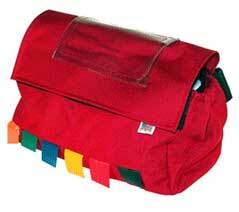 One of our best selling packs, the Aeromed pack is an extremely space efficient and durable pack. The Aeromed Pack is specifically designed for initial care of the critically ill or injured patient. The Aeromed Pack is most commonly used for ambulance, search and rescue, high rise rescue, helicopter or as a personal medical kit. In addition, the Aeromed Pack is an excellent specialty kit for trauma, pediatric, neonatal, burn, obstetrical, cardiac or respiratory patients. 1 - Set of Berman oral airways 1 - Adult Magill intubating Forceps 1 - Pedi Magill intubating Forceps 1 - #1 miller blade 1 - #2 miller blade 1 - #3 miller blade 1 - #4 miller blade 1 - #1 macintosh blade 1 - #2 macintosh blade 1 - #3 macintosh blade 1 - #4 macintosh blade 1 - Adult handle 1 - Pedi handle 1 - Sprague-Type Stethoscope 1 - Needi Blood Pressure Unit 2 - Triangular Bandages 2 - Kling Sterile Gauze Rolls 4� 3 - Gauze Sponges 4�x4� 1 - Ammonia Inhalant 1 - Glutose 1 - Paramed Scissors 1 - Rescue Mask 6 - ABD Pad 5�x9� 1 - Porous Tape Roll 1� 2 - Non-Sterile Gloves (Large) 1 - Sanizide� (16 Oz.) 2 - Cold Packs 1 - S.A.M. LIKE Splint 2 - Burn Free Unit Dose 1 - Aeromed Advanced Pack ** FREE GROUND SHIPPING ONLY** AIR SHIPMENTS RATES WILL APPLY. 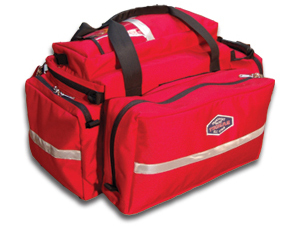 Still the premiere ALS bag in the EMS Industry. 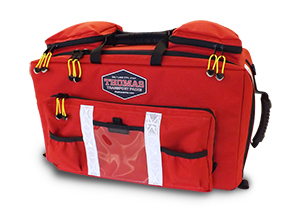 The Thomas ALS pack is designed to carry virtually all of the equipment and supplies needed by emergency medical teams to perform advanced cardiac and trauma life support. ALS Features Small and large exterior pockets allow additional supplies to be carried Small Pocket (6H x7W x 4D) Large Pocket (10 x 14 x 3) Top and side handles allow easy carriage Upgraded, dual-adjust backpack straps with chest connect and �tuck-away� pocket, which allows the backpack straps to remain connected for quick carrying, yet protected from contaminants and everyday wear and tear. 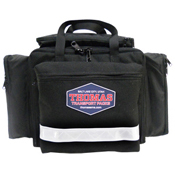 OPTION: THOMAS EMS ALS PACK THOMAS EMS PACK FLUID FREE BLACK. Large EMS Emt kit consists of the following 1 Adult Bag Valve mask, 6 nitrile latex free gloves, 10 4"x4" gauze sponges, 1 Bite Stick, 20 2"x2" gauze sponges, 1 mylar emergency blanket, 1 instant cold pack, 1 instant heat pack, 1 roll of coflex-med flexible hand tear bandage, 5 4" conforming stretch roll gauze, 5 3" sterile conforming stretch gauze roll, 5 2" sterile conforming stretch gauze roll, 1 pair of Truama Shears 7 1/2", 1 4" elastic bandage, 1 2" elastic bandage, 1 Needi Jumbo Triangular Bandage 40" with two safety pins, 5 5"x9" abdominal pads, 5 8x10 abd pads, 1 OPA KIT (set of 6 pcs), 1 Needi BP Cuff adult, 1 dual head sprague stethoscope latex free ,20 anti septic hand wipes, 1 Finger ring cutter, 1 Kelly hemostat 5.5" straight, 1 Needi Diposable penlight with pupil gauge, 1 roll of 1" clear adhesive tape, 1 face mask with eye shield, 5 knuckle flexible bandages, 16 1"x3" plastic adhesive bandage strips, 1 Trauma dressing 10"x30" sterile, 10 2"x3 (xlarge) plastic adhesive strips, 100 alcohol preps & 5 medium sized red bio haz bags Bag Size: 11" X 12"X 5"
Emergency Responder Pack is specifically designed for initial care of the non- serious, critically ill or injured patient. 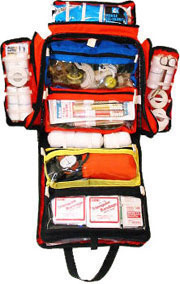 The ER pack is most commonly used for ambulance, search and rescue, high rise rescue, helicopter or as a personal medical kit. In addition, the ER pack is an excellent specialty kit for trauma, pediatric, neonatal, burn, obstetrical, cardiac or respiratory patients. 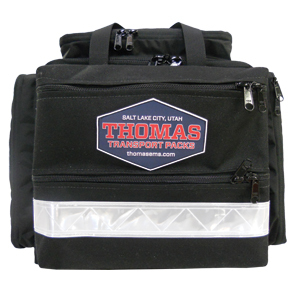 Features: 4 interior color coded vinyl window pockets 3 medium exterior pockets 1 large hidden pocket 3 small vinyl window interior base pockets The placement and closure of these pockets is specially designed to reduce the likelihood of equipment loss. 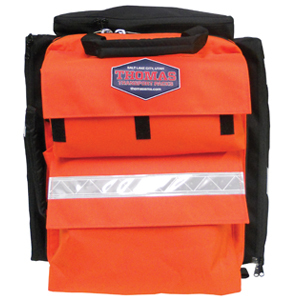 The color coding and clear vinyl front pockets allow rapid location access of equipment and supplies as well as quick re- stocking. The D rings on the back of the pack allow shoulder straps to be easily attached. The ladder frame of the pack can also serve as a splint when needed. Dimensions: 11" x 12" x 5" *Does not include shoulder straps. Shoulder straps sold separately. The multi purpose pack serves the needs of many. 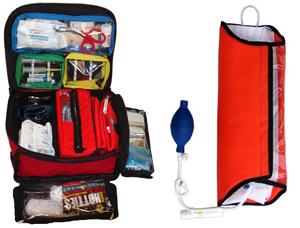 Support pack, intubation pack, first aid, daily accessory pack or basically whatever purpose you find for it. The pockets have been designed to allow you to open the pack while it is draped over your shoulder allowing you to have both hands free to easily access the contents inside. 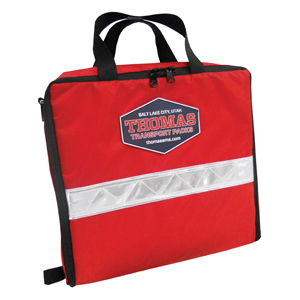 Features: 2 interior vinyl window pockets 1 hidden pocket 2 small vinyl window interior base pockets Dimensions: 12" x 11" x 3"
The Thomas O2 Supreme EMS Oxygen Bag. 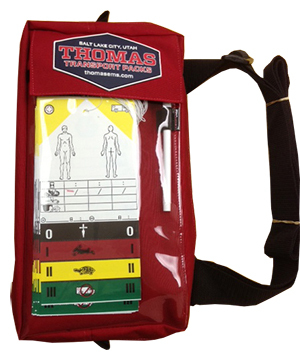 Our largest and most comprehensive 02 pack ideal for ALS response from both ambulance and fire apparatus. The O2 Supreme features: Designed to accommodate up to a �D� sized tank, multiple sizes of BVM�s, intubation, IO, pulse oximetry, and all other initial assessment and wound treatment supplies. OPTIONS: ZENITH ALS/BLS ZENITH FLUID FREE BLACK ONLY.